From among the huge collection by leading domestic boombox collector, was introduced in a systematic visual design of choice, "Design of radio-cassette!" Boom box, the world's first visual book. "Design! 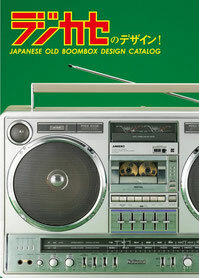 JAPANESE OLD BOOMBOX DESIGN CATALOG of boombox" DVD was visualized this document will be released on June 27 from the video sales company Polydor. About 110 minutes. 6,980 yen (tax included).